___Arnout Meijer, born in the Netherlands, graduated from the Design Academy where he completed the bachelor Man & Activity in 2012. His primary design focus is light. 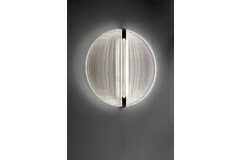 According to Meijer, light relates to both science and art, which is what inspires him to work with it. He perceives light as pragmatic and fundamental, but also as a seductive power. Meijer habitually uses his fascination for optical physics and digital technology as the starting point for his works. According to him, the manipulation of optics can cause an abstruse and therefore surprising effect on the spectator. The results of his work are not only light fixtures, but sculptures and installations as well. In 2013, Meijer launched the ‘Thanks for the Sun series’. The series is based on the notion that human beings can best experience light of varying warmth and intensity within the 24-hour cycle: bright white during the day to help us stay alert and concentrate; warmer, soothing light during the evening to help us wind down and prepare for sleep. Meijer has designed the Thanks for the Sun Series to allow users to adapt the temperature and character of the light in their rooms. In 2014, the 'Thanks for the Sun series', was nominated for D3 Award imm Cologne. Meijer’s work has been presented and exhibited on various occasions, among others, Moscow Biënnale 2015 (Moscow), Musée des Arts Décoratifs (Paris), Design Basel (Basel), Stedelijk Museum (Amsterdam), Het Nieuwe Instituut (Rotterdam), Spazio Rosanna Orlandi (Milan), Noordbrabants Museum ('s Hertogenbosch), and Salone del Mobile 2014 (Milan). Find out more about Meijer’s captivating ‘Thanks for the Sun series’ in our webshop.